Our old friends, Peter and Norah Joslin, recently visited us at Daws Heath. Living in Devon now, they are both Essex born and bred and regularly visit relations and friends in this area. We were chatting away over a cup of tea when Pete told us a very sad story of the Byatt family of Thundersley. A few days later Norah, the family`s historian, sent me a full account of the tragic circumstances which I publish below. “At the end of the first world war Frederick Byatt, a ship`s plater in the London Docks, decided on a career change and moved with his wife, Alice, and their six children to a property called Oakwood Villa in Kiln Road, Thundersley. The semi-detached house still stands opposite the Castle Point Council Offices. Then it had some land attached where Frederick could keep a couple of cows and some pigs and chickens. He also farmed the fields now occupied by the Council Offices and SEEVIC. It must have been successful because by the mid-twenties he had bought Howe Green Farm at Cold Norton. On the 31st May 1920 at 1.30pm the Byatt family experienced a great tragedy when three of the children, Elsie, Arthur and Doris then aged 9 years, were returning to school after lunch at home. At the same time, a motor lorry carrying employees of a cardboard box manufacturing company on an outing to Southend from Walthamstow was proceeding along Kiln Road at about ten or eleven miles per hour. For some unknown reason Doris broke away from her siblings and ran about four feet into the road, something having attracted her attention. The driver shouted, sounded his horn and tried to avoid hitting the young girl by mounting the pavement but by the time Doris realised and turned back it was too late and she was struck by the lorry. Doris was taken to Dr Grant`s house who concluded that her skull had been fractured. She was unable to be saved. At the inquest, Dr Grant stated that in his opinion the driver was perfectly sober and indeed had a clean driving record for over twenty years. The coroner`s verdict was “accidental death”. 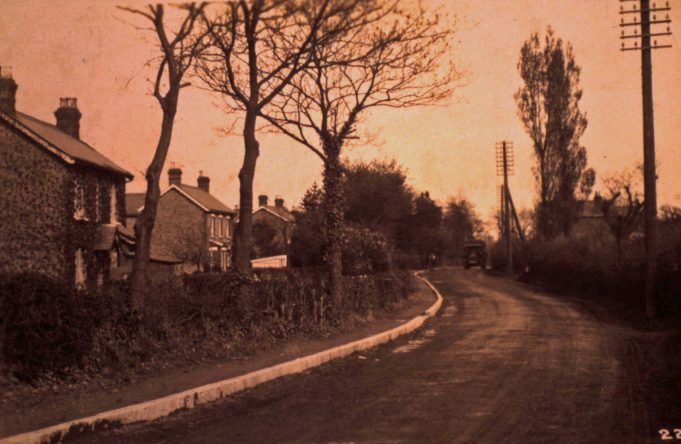 The photograph of Kiln Road at the head of this article does not show where the accident happened but is included to give a feeling of how much more rural things were in 1920 in this part of the world. The second is a rather splendid photograph showing the family in happier days twenty years after the sad event recorded above. 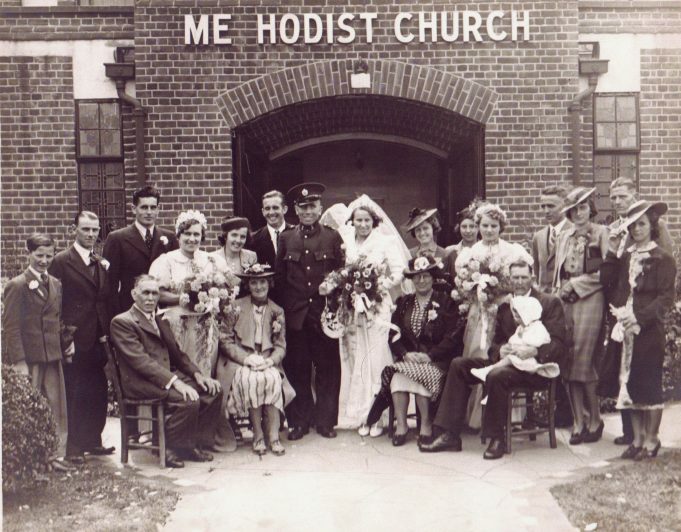 The church with the missing “T” will be recognised by many of our readers as the Hadleigh Methodist Church at the corner of Chapel Lane where it meets the A 13. The groom`s parents, Frederick and Alice Byatt, are seated on the left. Their other children all standing are: Walter third from left; Gladys fifth from left; Eric next to her and fourth from right is Fred. I certainly remember the Dunn family, especially the one on the extreme right. I am sure another one is Charlie who worked on the Salvation Army colony.